No, not Deep Purple the British hard rock group but deep purple the color. 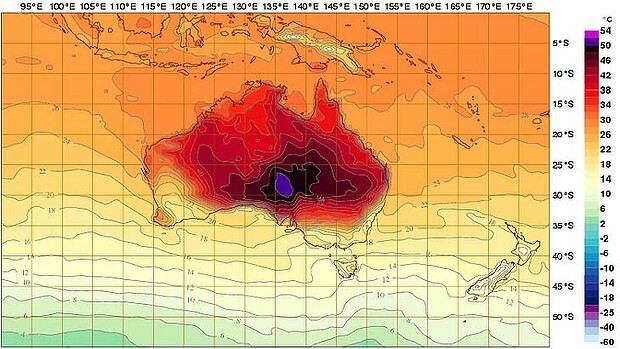 And pink… on Australian weather maps. These are the new colors to represent the temperature range between +50 and +54 degrees Centigrade. There is another word to describe such temperatures: death. This is not funny anymore. If weather like this becomes more common, parts of our planet will simply become uninhabitable by humans without high technology life support (such as reliable, redundant air conditioning). In other words, it’s like visiting an alien planet.